It’s been one of the more ‘romantic’ FA Cups of recent seasons, what with giants being slain hither and thither and Crawley getting the dream draw at Manchester United in the fifth round. But the magic it once had is wearing off in general and we can show it with statistics. Crowds overall were almost 13 per cent lower for the Cup this weekend than for league matches, when all 16 games are considered as a whole. Only five of 16 home teams attracted more people for the Cup than they have done on average in the league this season. Notts County were 138.3 per cent up on their average, to 16,587 fans, but then they were facing a glam side from Manchester. Southampton were up 33.9 per cent hosting the other glam side from that city. Stevenage were up (facing Reading), Torquay were up (Crawley) and Watford (Brighton) makes five. Attendance at the Emirates for Arsenal’s match with Huddersfield held remarkably steady at near capacity but other Premier League clubs leaked support. Nowhere was that truer than at Wolves, where 15,000 regular attenders stayed away, and that despite Stoke providing top-flight opposition. Aston Villa lost more than 11,000 fans, and Bolton more than 7,000. 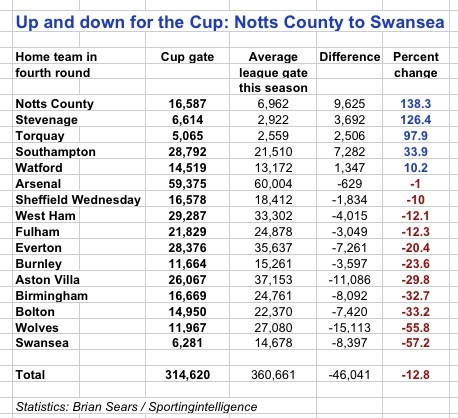 But at the foot of our table of losses, calculated by percentage drop, comes Swansea, where more than 57 per cent of the usual gate stayed away. Perhaps fans disaffection with the Cup was matched by their players as both Wolves and Swansea failed to make the next round, losing to the Potters and Orient respectively.